At the end of the movie, you come out of it with a question: "Who is Marilyn Monroe?". 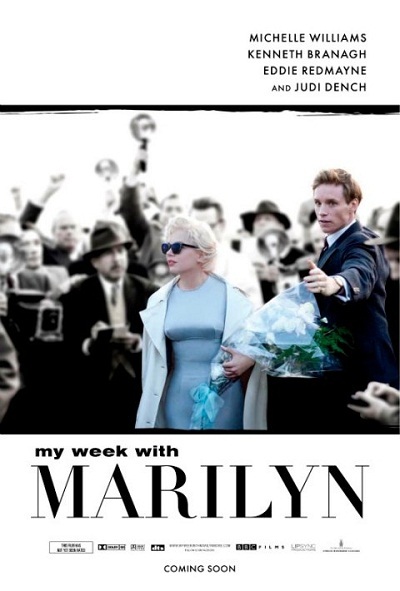 Michelle Williams turns in a finely tuned, complex performance of the enigma that is Marilyn. Williams brings out the vulnerability, coyness, child-like naiveté and mixes in with the femme fatale, bimbo, and borderline/narcissistic personality. She deserves her expected Oscar nomination, but a win? Her acting can be a bit too distracting to the character she tries to portray. What growth she had since the days of "Dawson Creek". The movie itself by Simon Curtis though, as described by a character, is just a light, fluffy dramedy. Not a serious contender in the Best Picture race. Kenneth Branagh is outstanding and may get a nom for Best Supporting Actor. Judi Dench, Julia Ormond, and a very un-Herminone Emily Watson (hopefully, Williams can be a positive role model for her to blossom into a character actress) rounds out the cast. One thing I really liked abour the show is the beautiful piano accompaniment throughout ("Marilyn's Theme") composed by Alexandre Desplat and performed by Lang Lang.